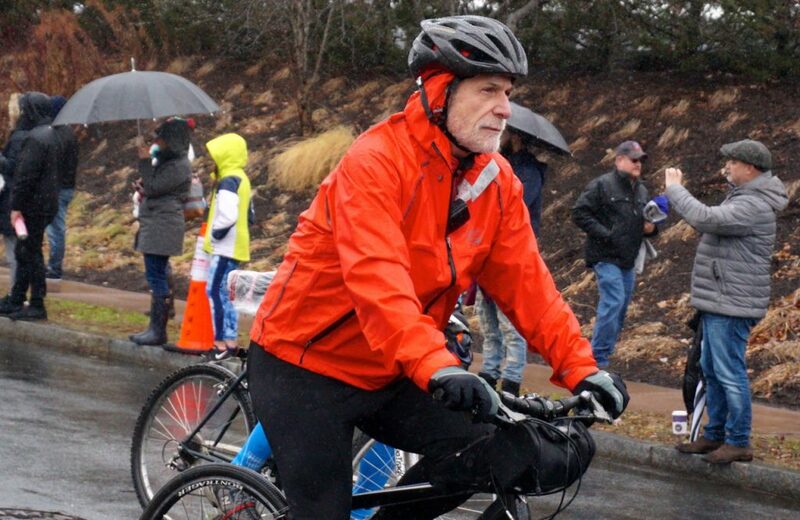 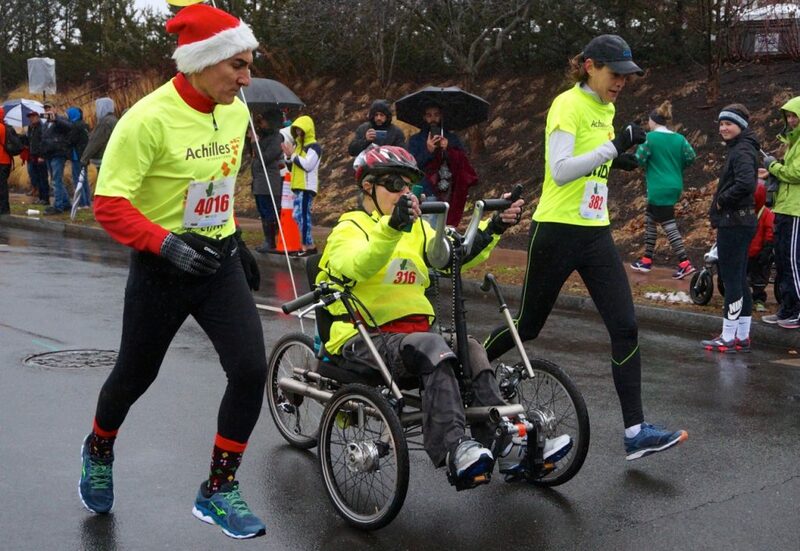 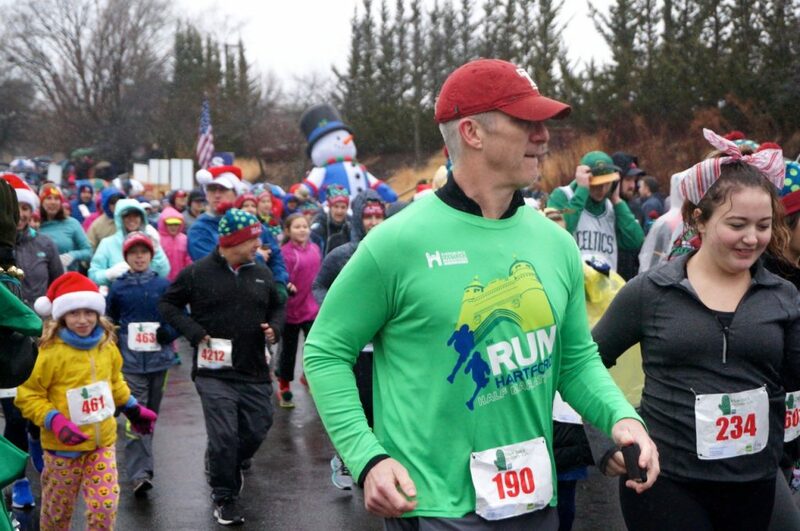 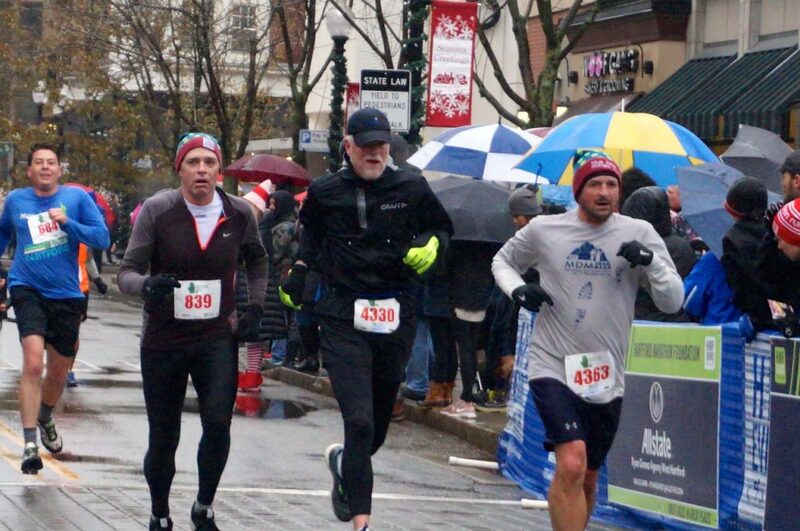 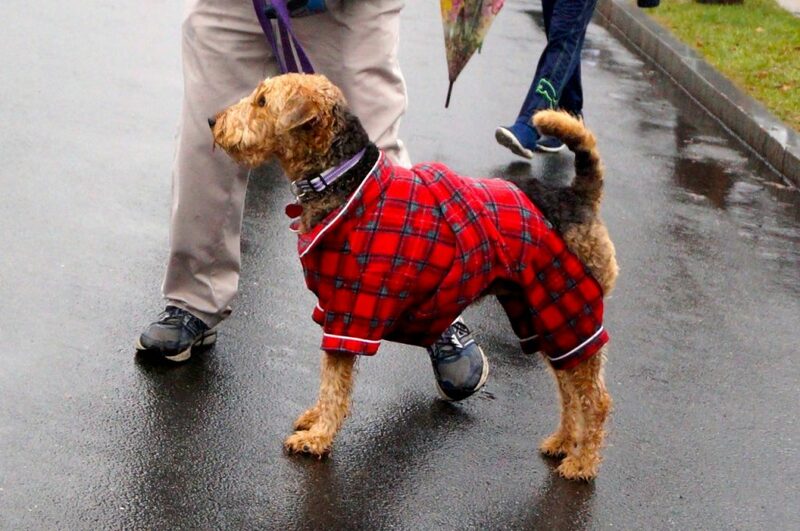 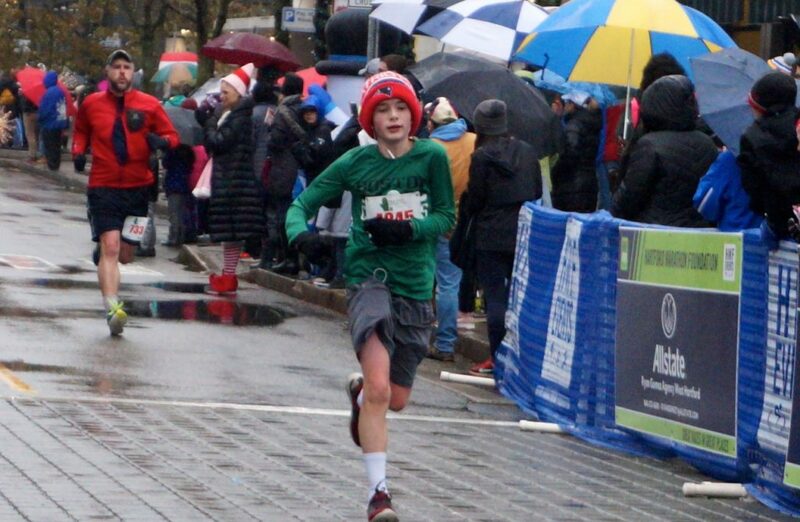 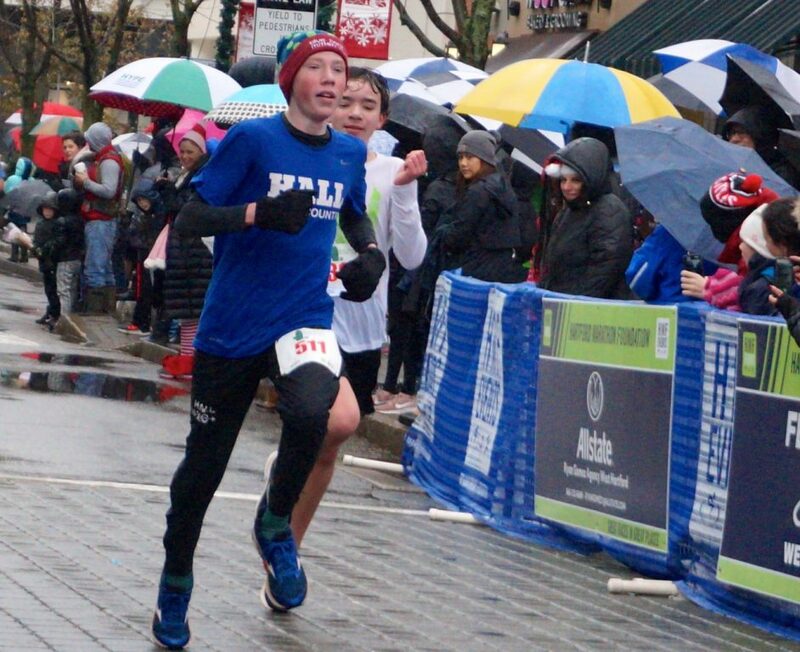 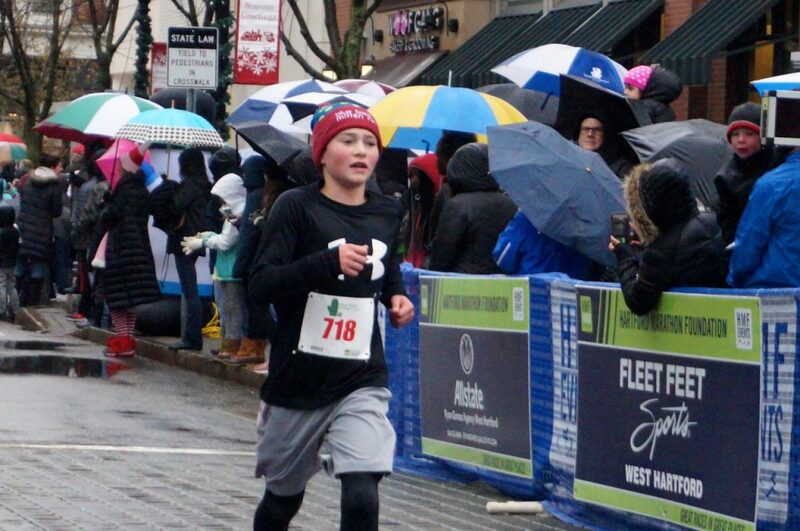 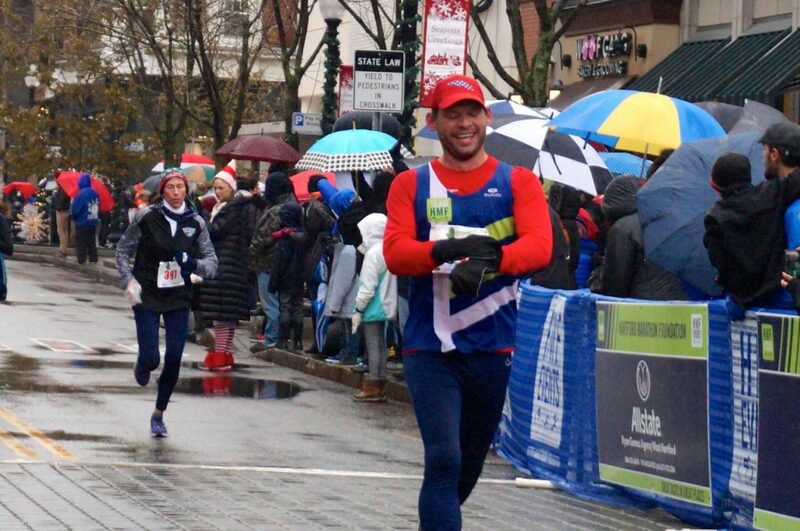 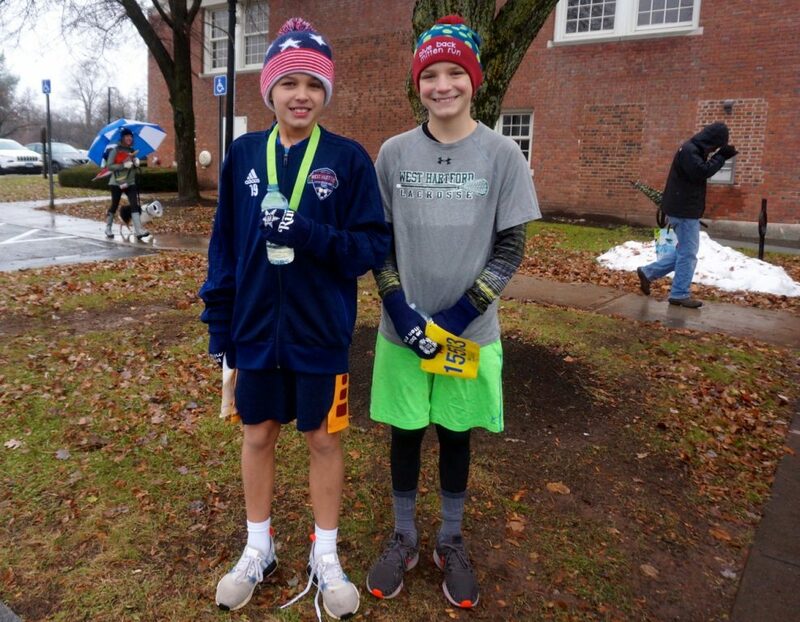 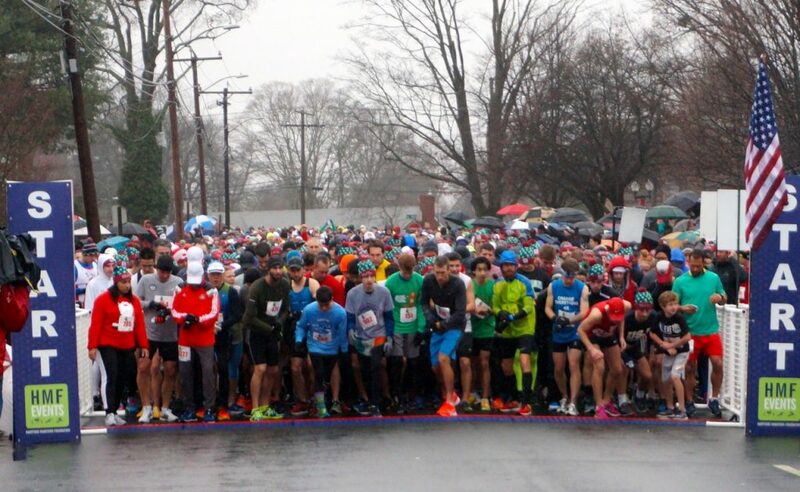 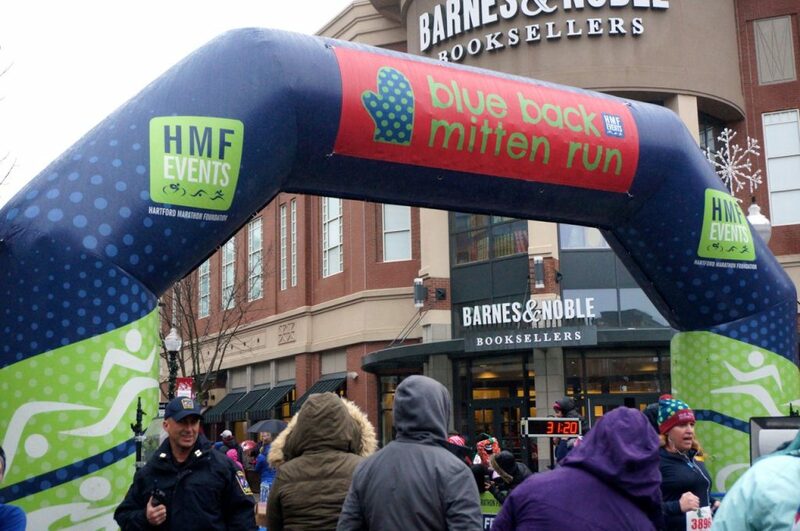 A festive crowd braved the rain on Sunday morning in West Hartford for the annual Hartford Marathon Foundation Blue Back Mitten Run. 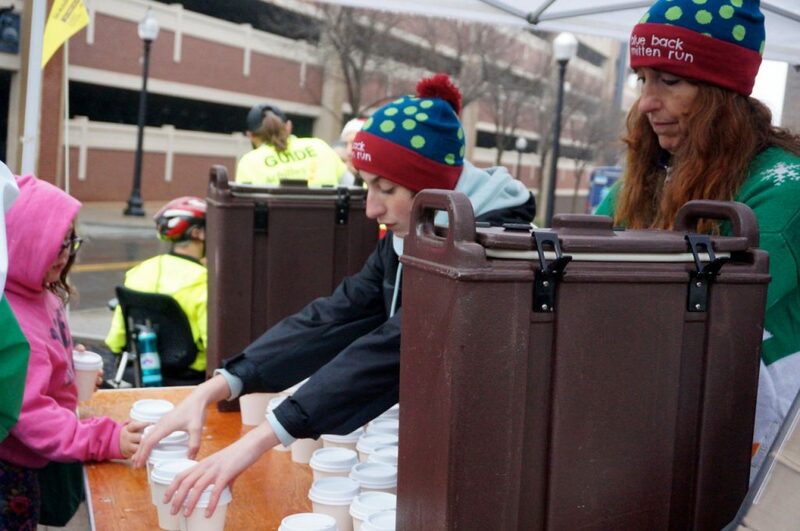 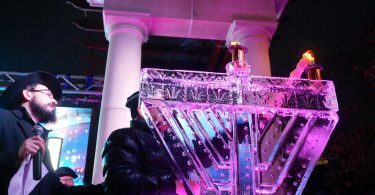 The cocoa being served at the end of the Blue Back Mitten run was a good motivator on a chilly and wet morning as more than 1,300 runners took to the streets of West Hartford for the Hartford Marathon Foundation’s (HMF) annual Blue Back Mitten Run. 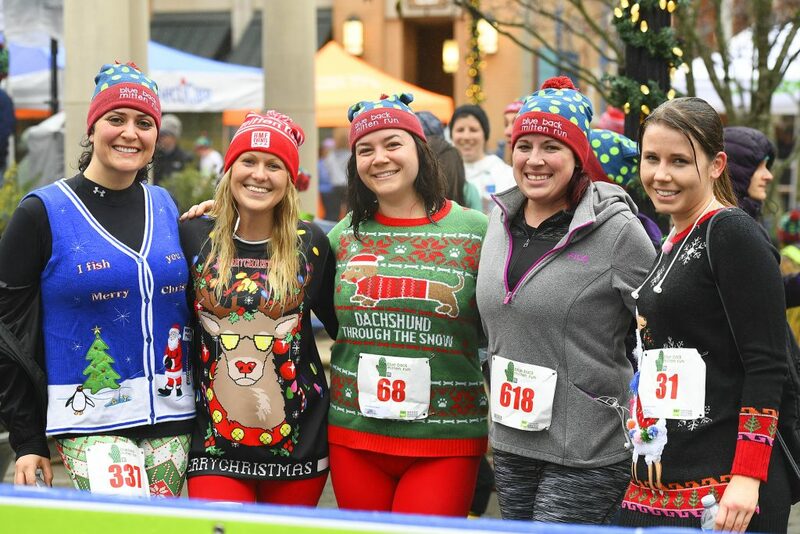 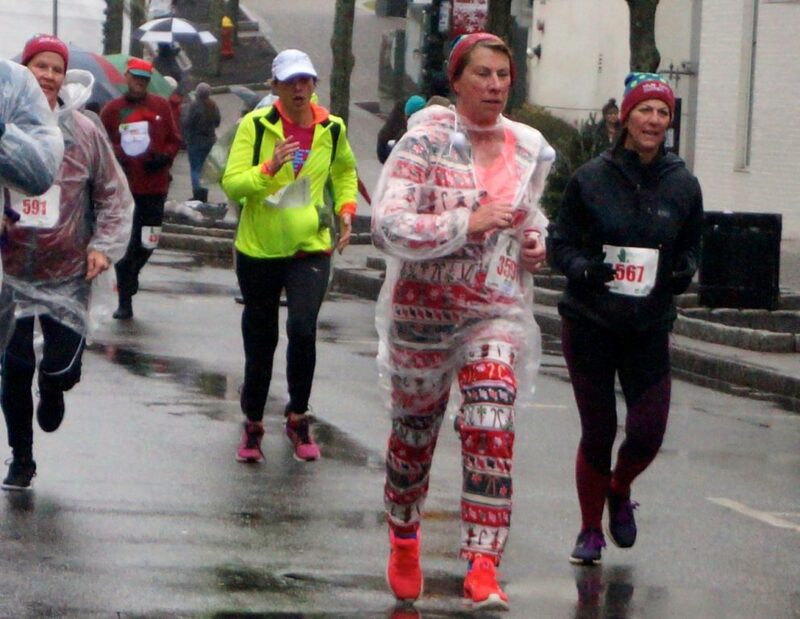 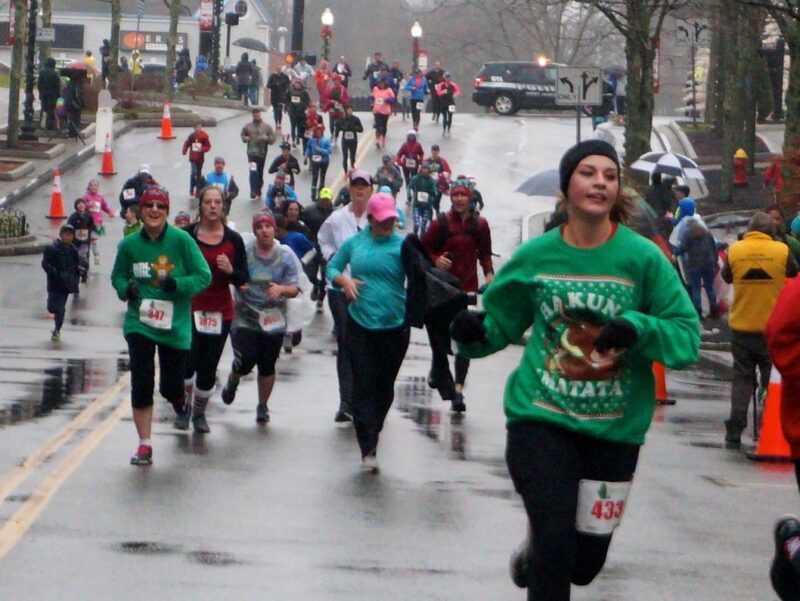 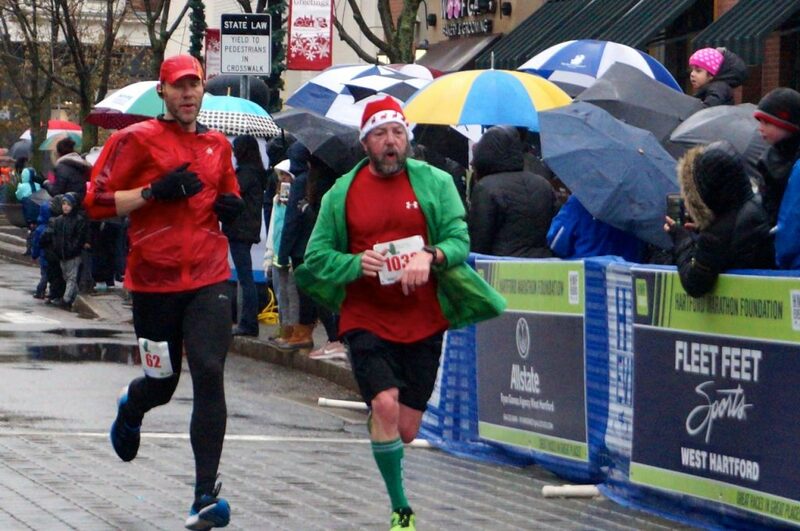 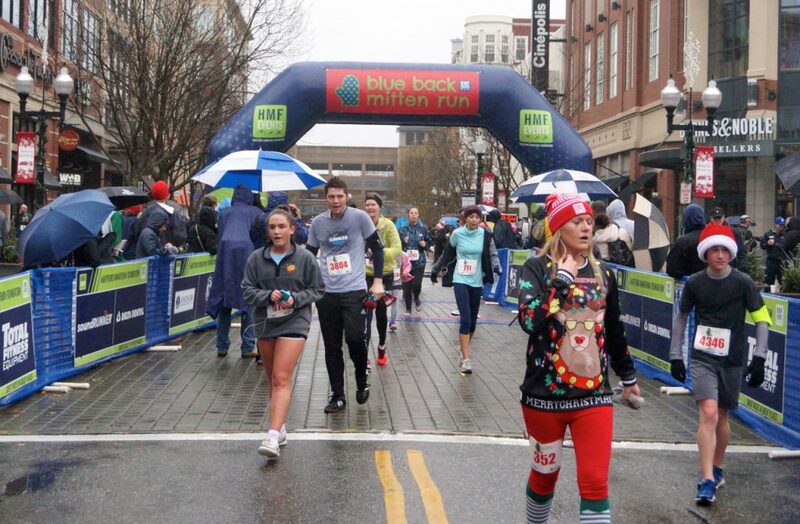 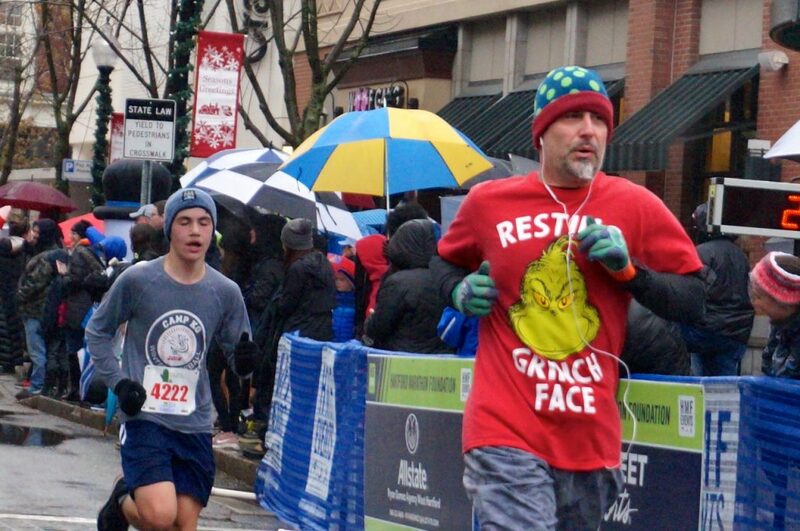 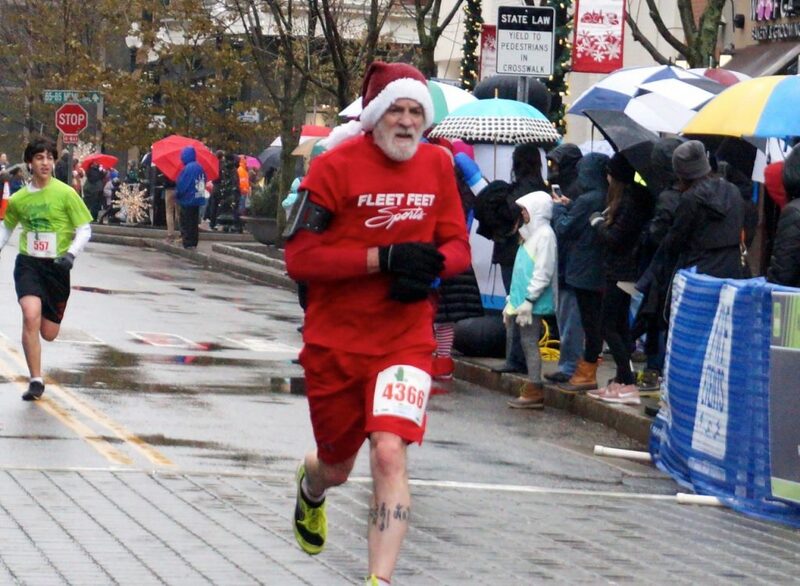 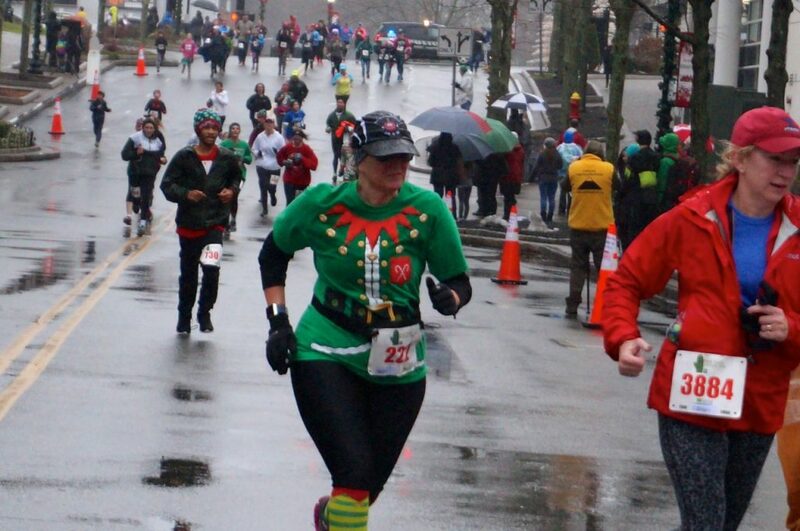 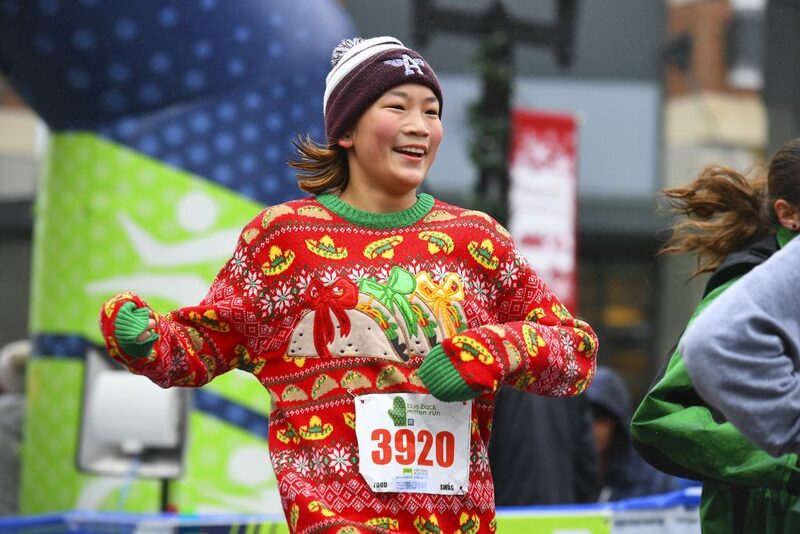 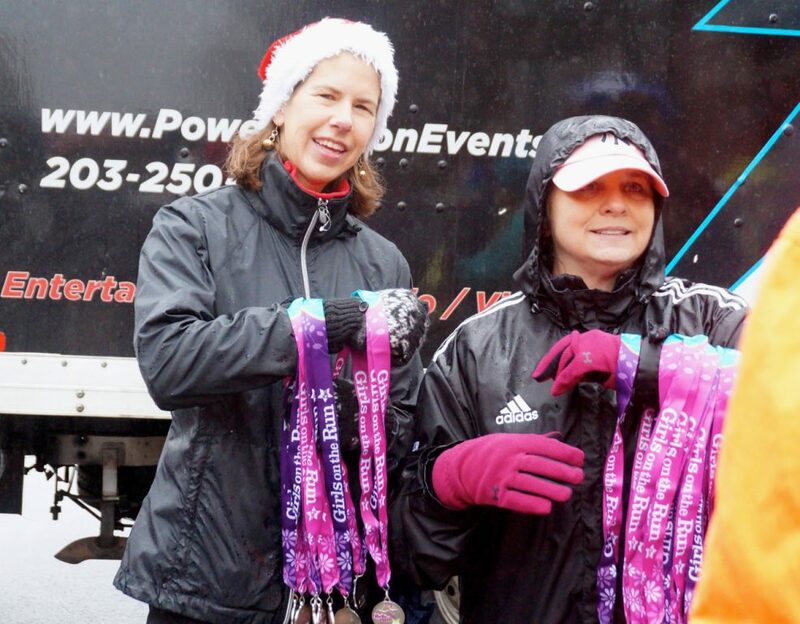 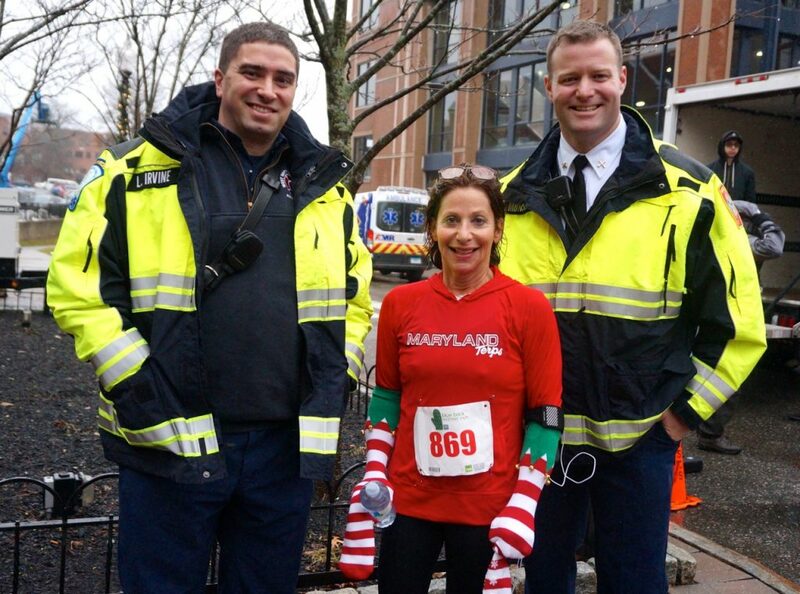 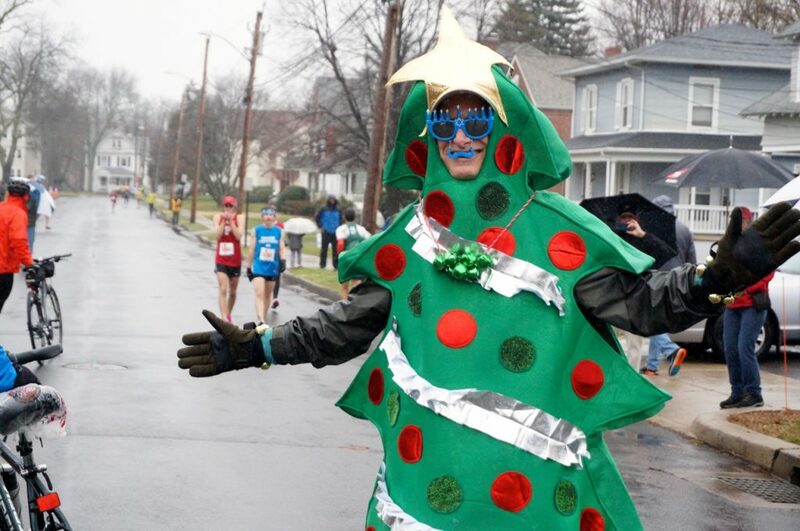 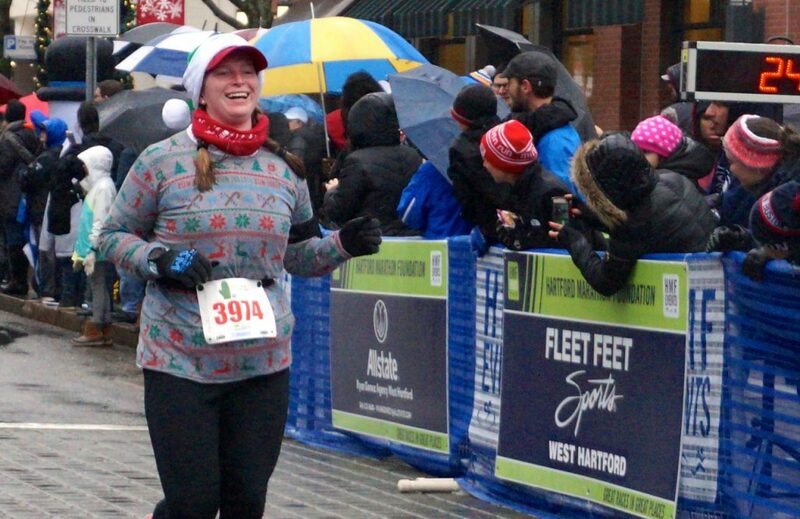 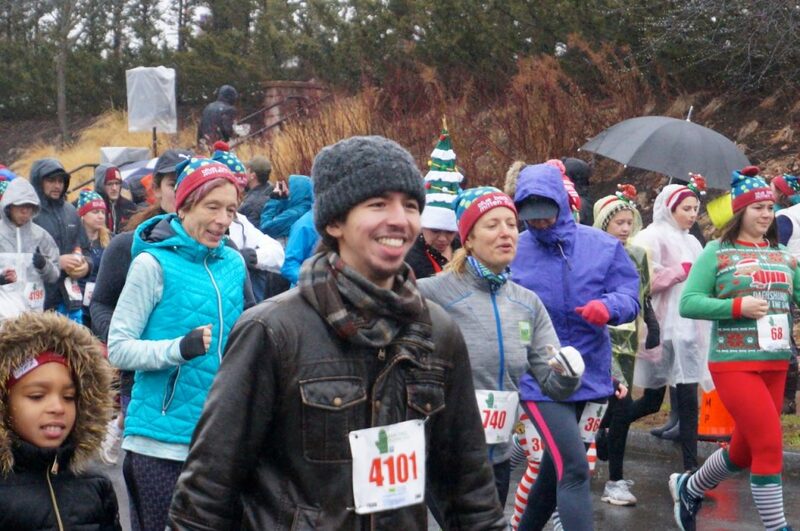 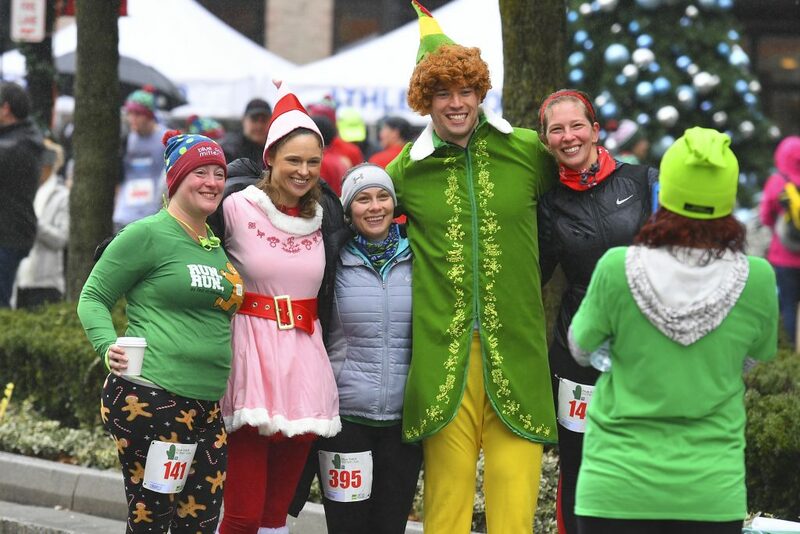 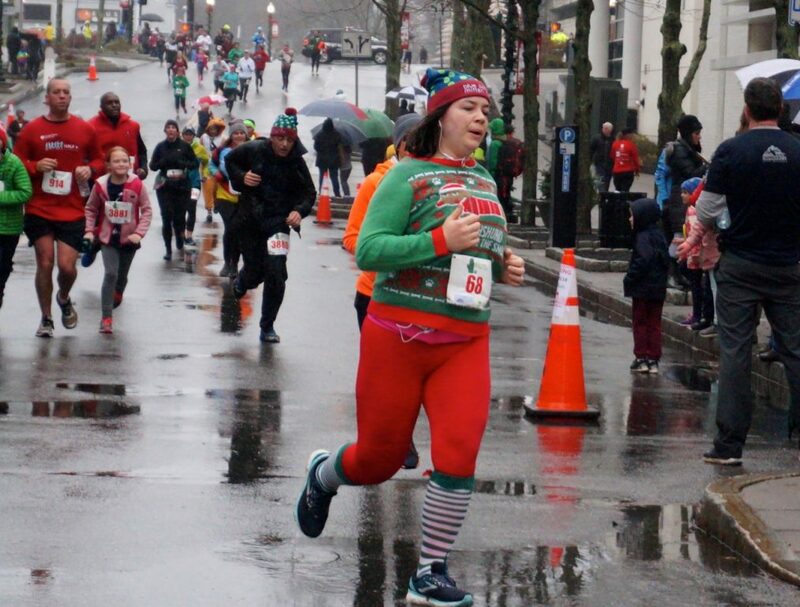 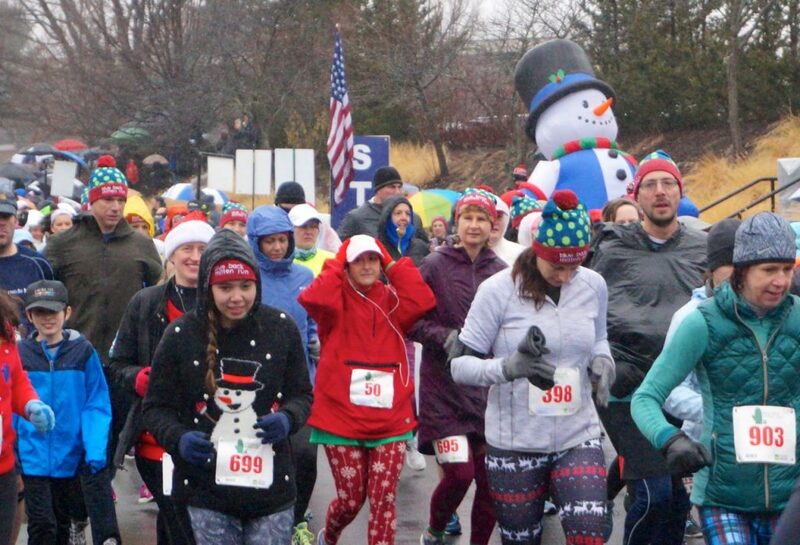 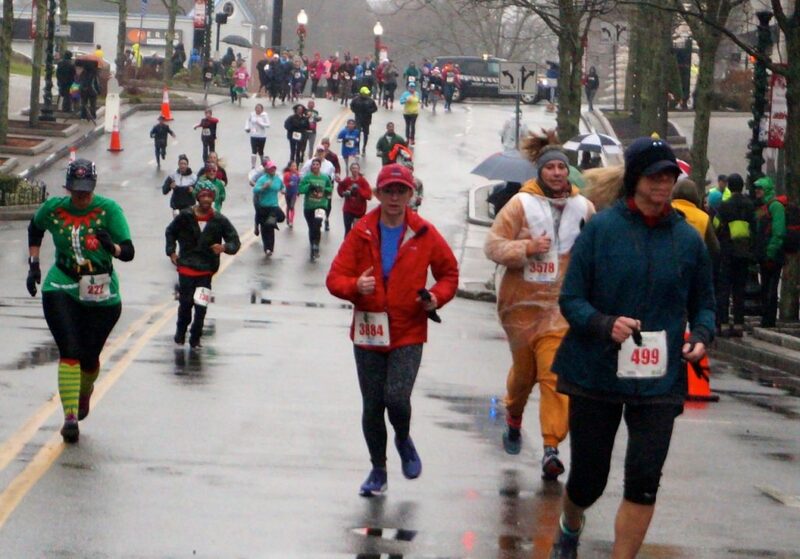 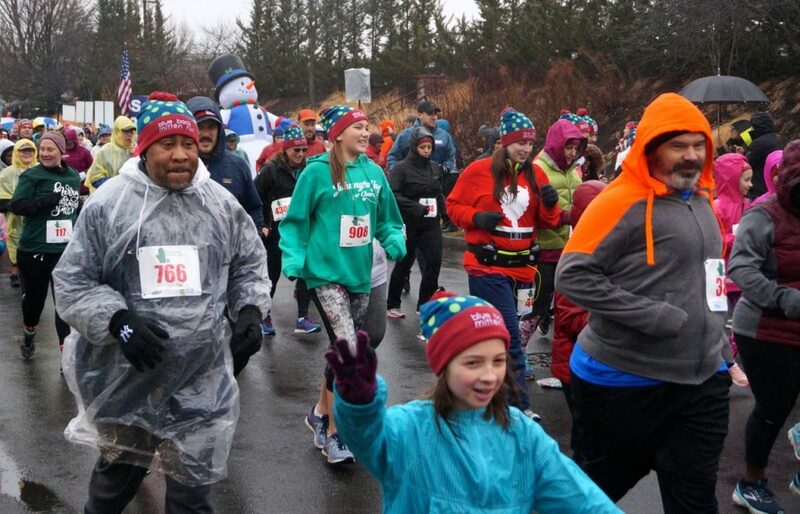 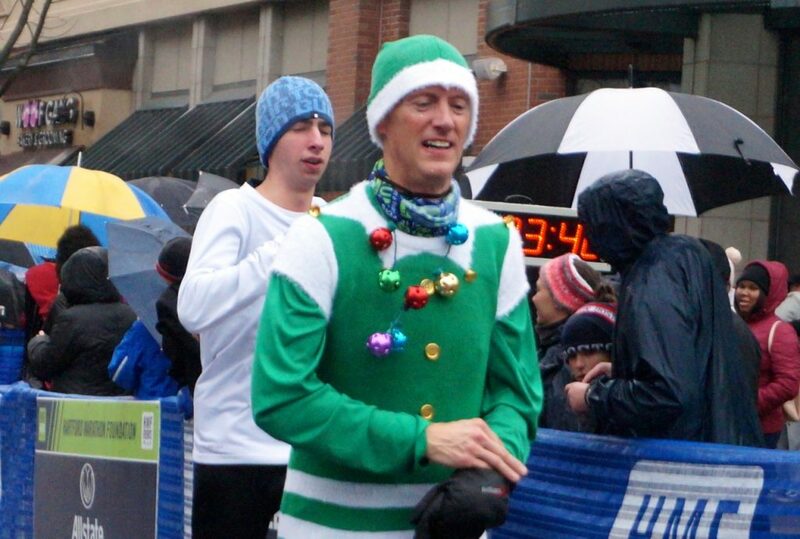 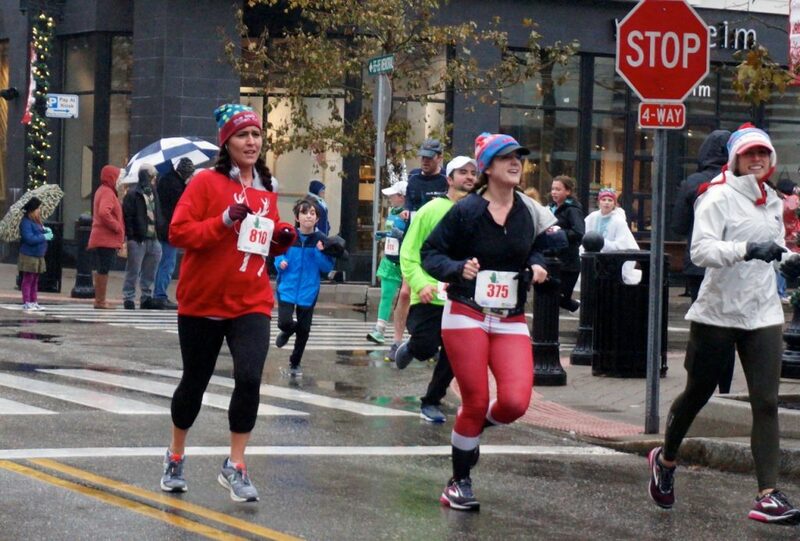 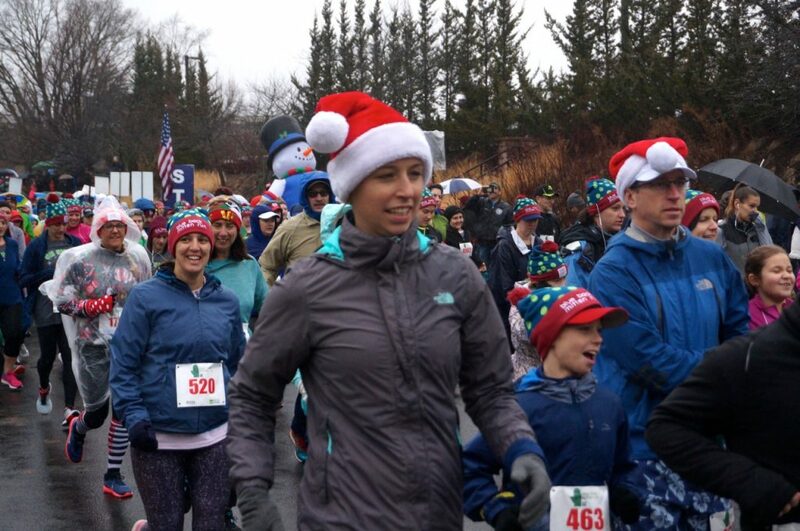 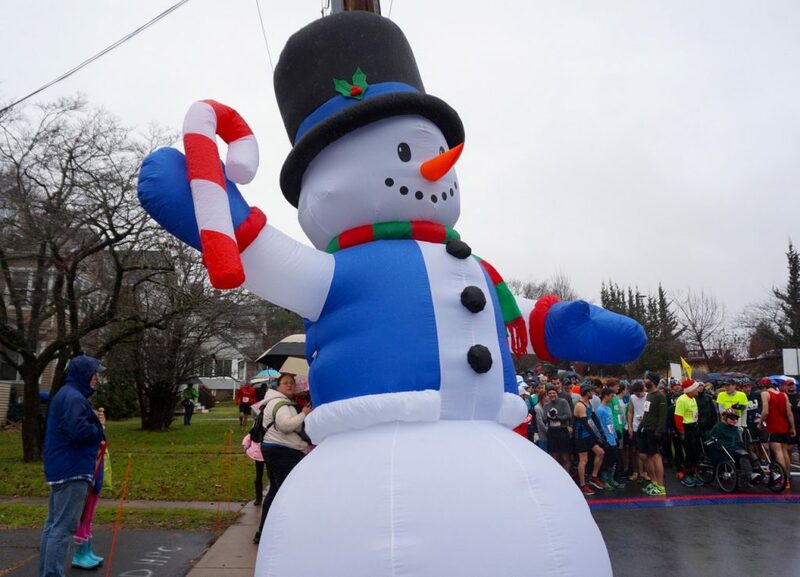 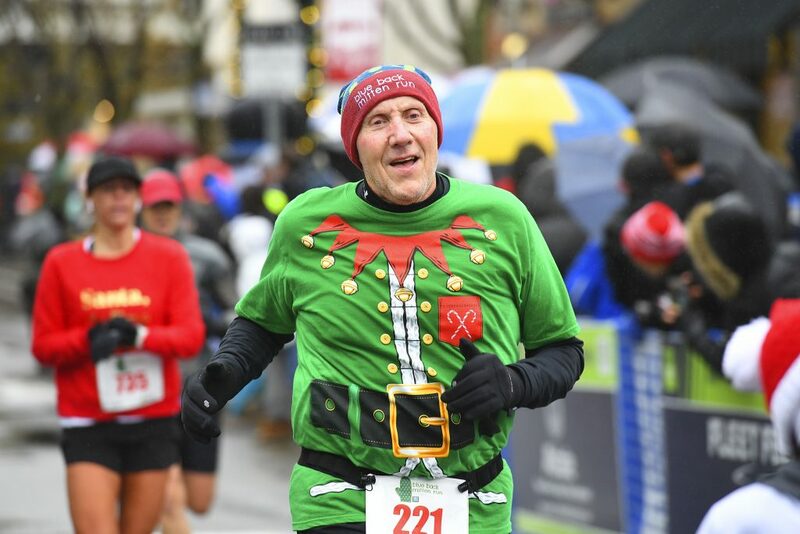 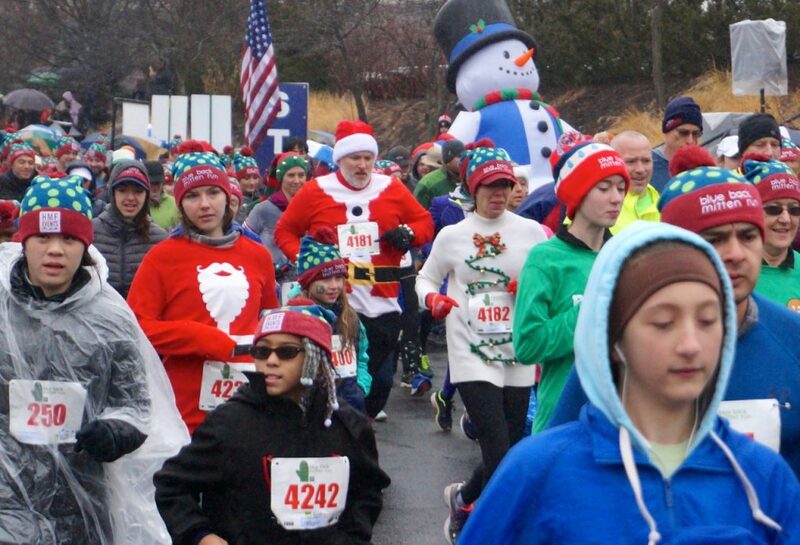 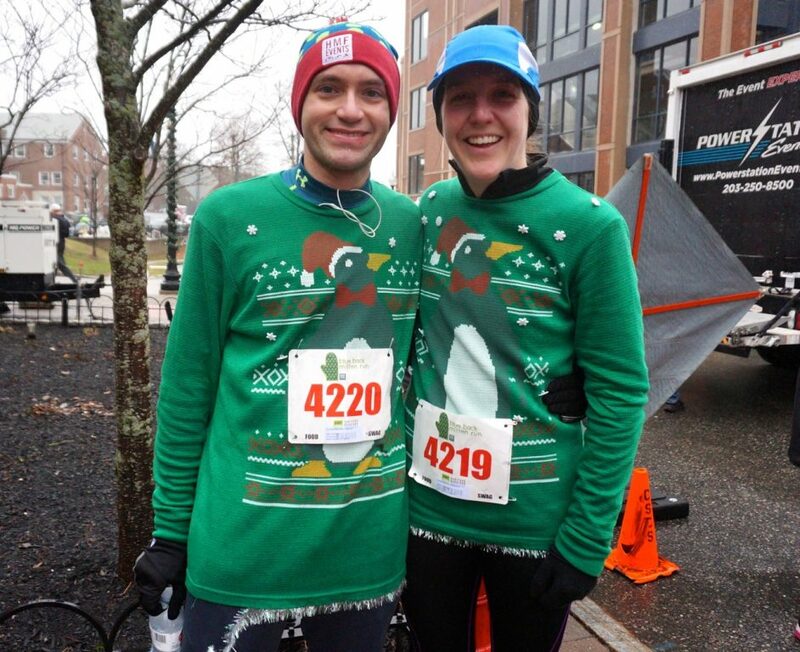 Many of the runners came decked out in festive costumes, with quite a few soggy Santas completing the 3.1-mile course. 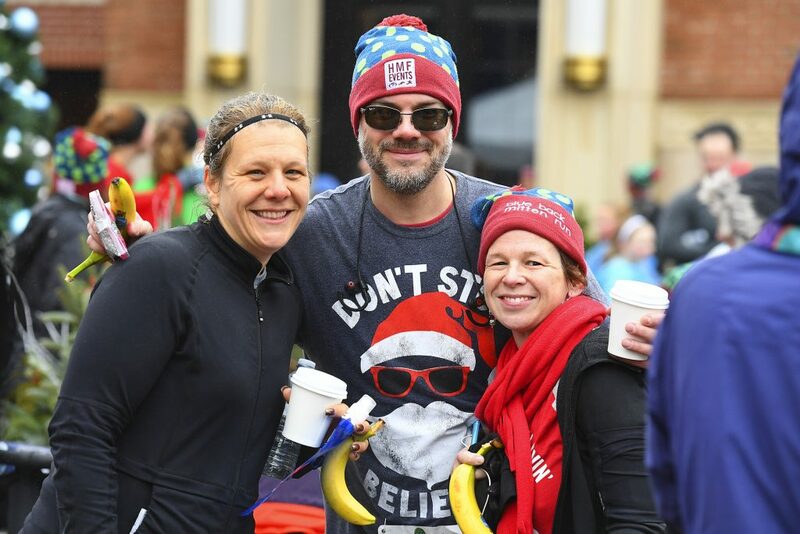 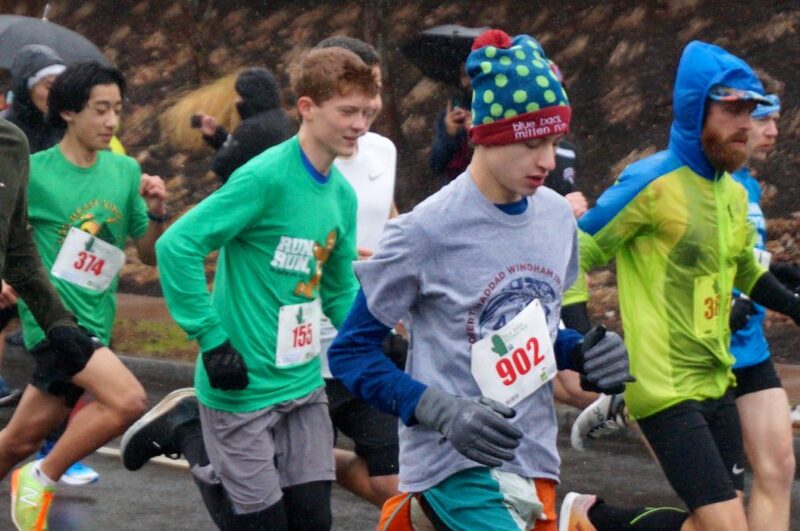 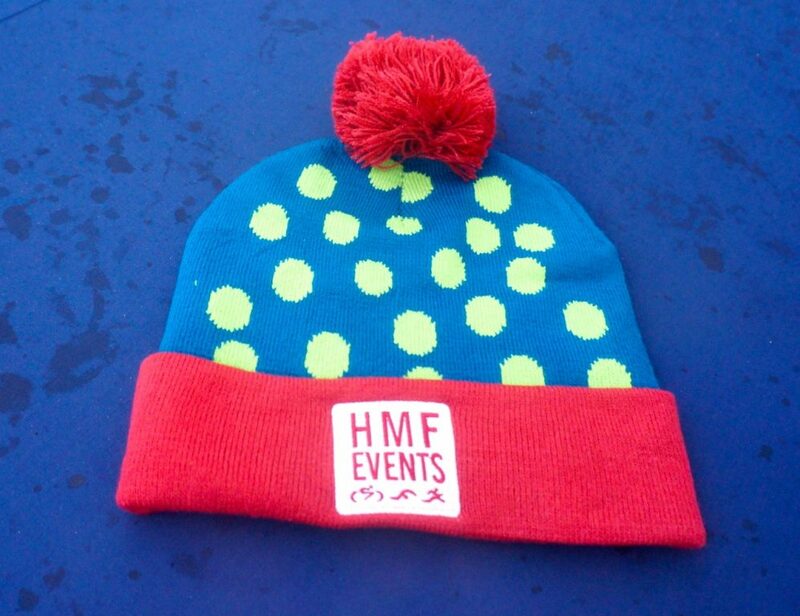 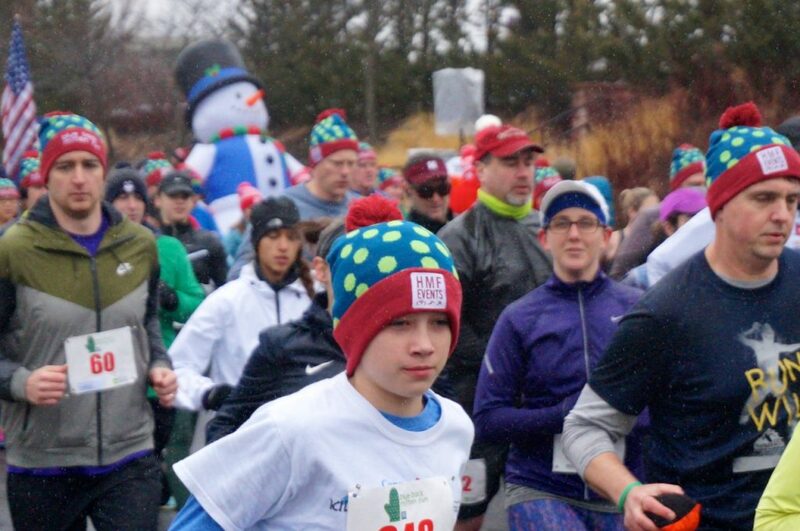 Other runners immediately donned the colorful knit caps which were being distributed as part of the registration for the run, the HMF’s final race of the year. 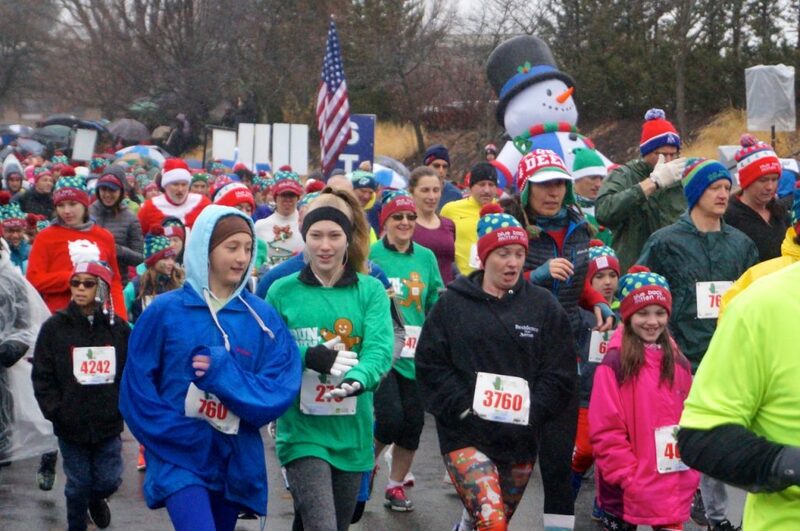 In the spirit of the season and of community, donations of new mittens, gloves, scarves, and hats were donated by participants, and will be given to needy residents by West Hartford Social Services. 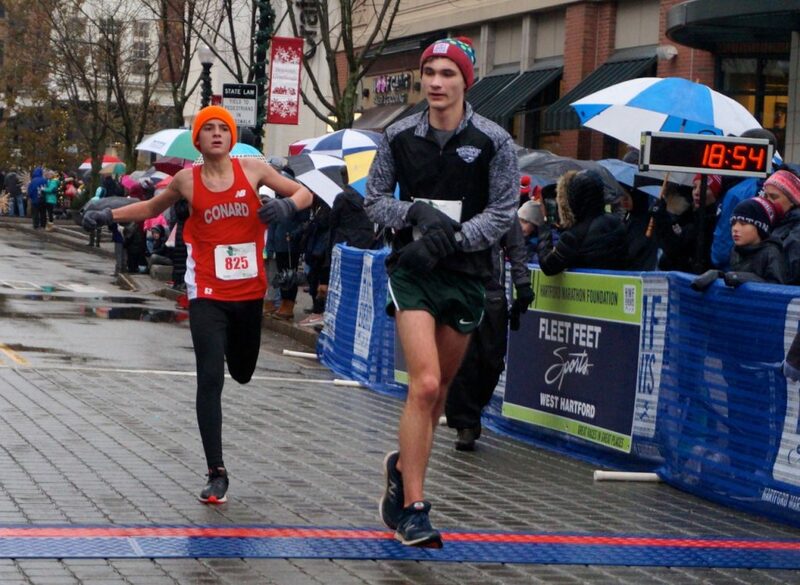 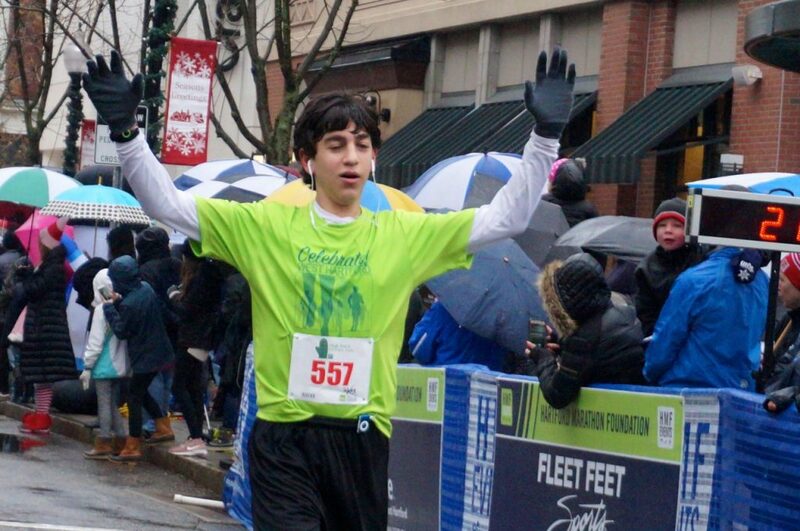 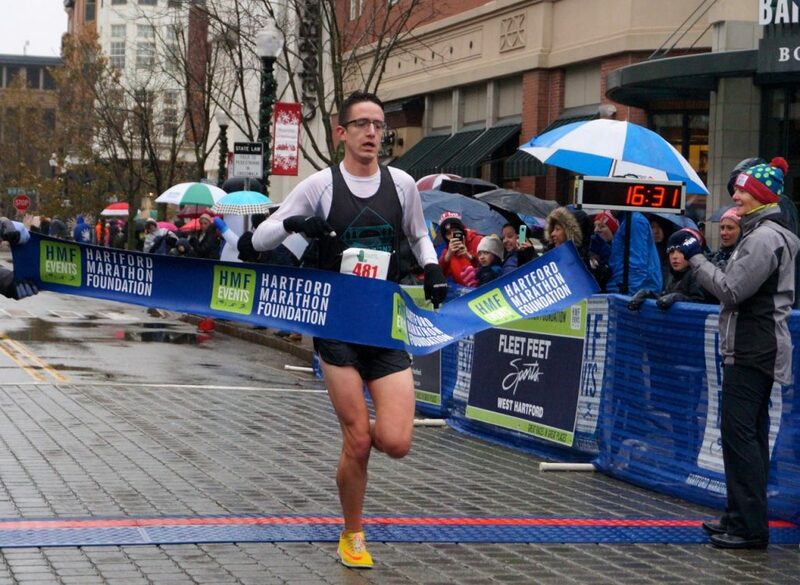 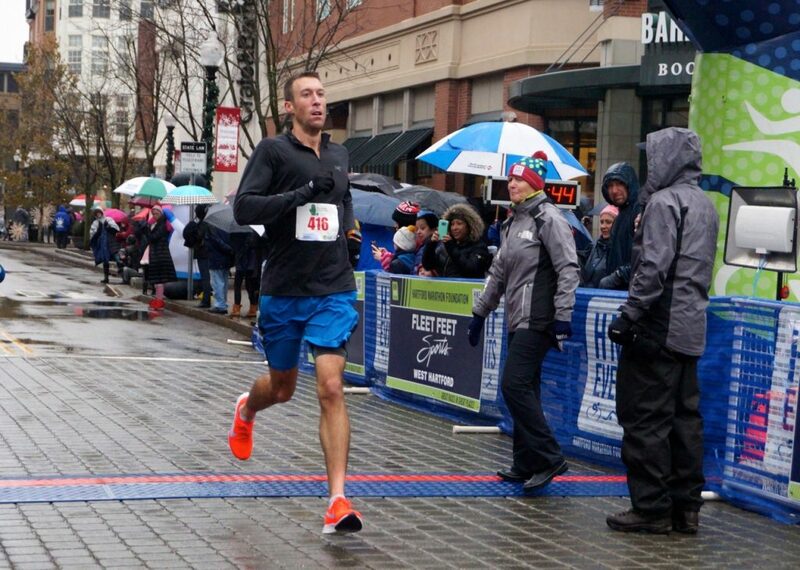 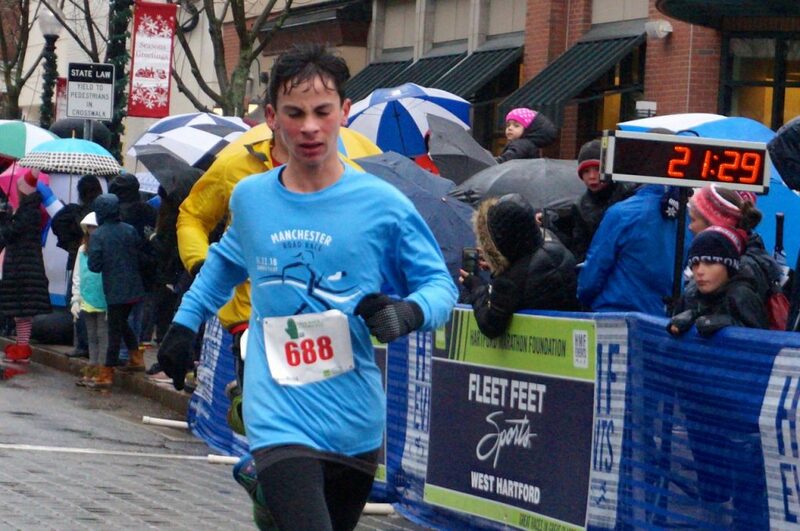 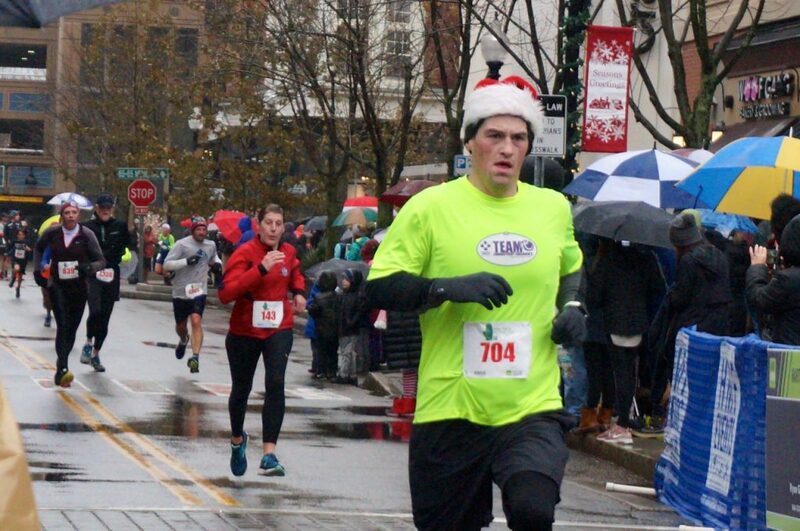 Chris Angelo, 23, of West Hartford, was first to break the tape, finishing the 5K in 16:30. 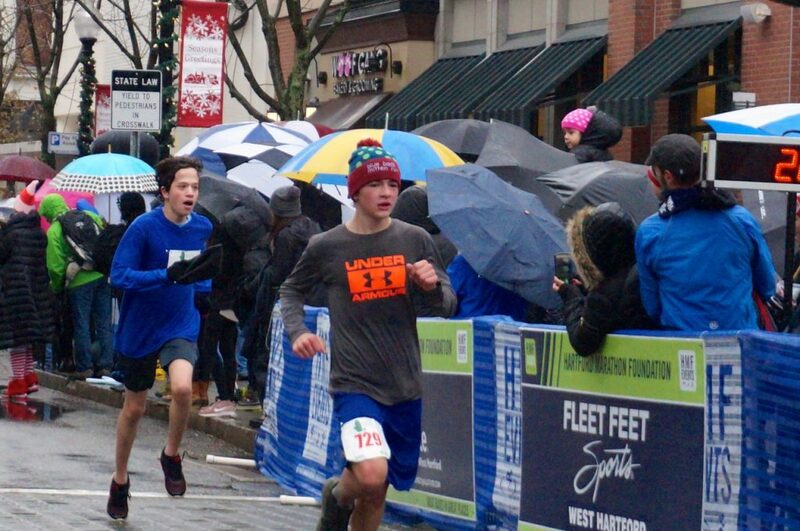 Gregory Weaver of West Hartford finished second (16:45), followed by Steve Allen of Farmington (17:20). 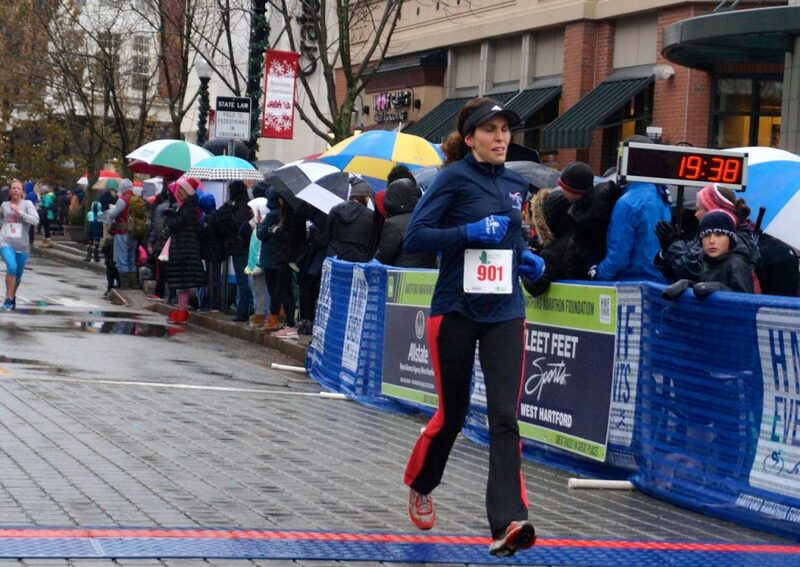 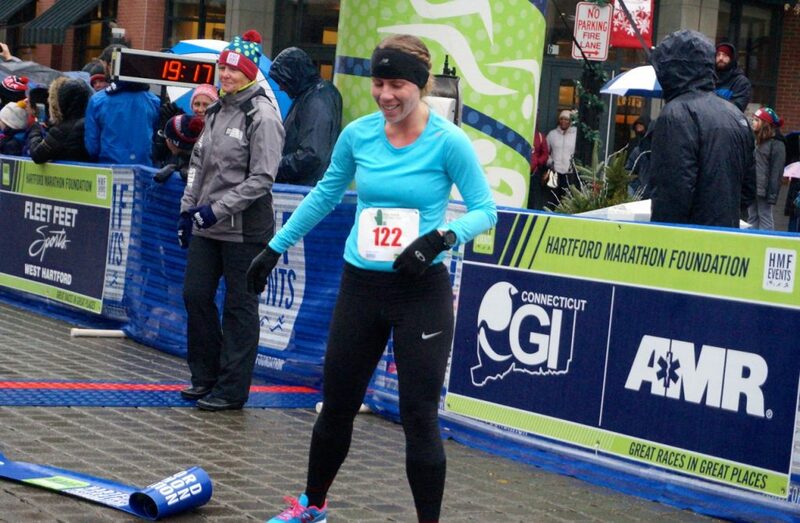 Alyssa Selmquist of Portland was the first female finisher in 19:14, followed by Laura Barash of West Hartford (19:36) and Molly Bennett of West Hartford (19:42). 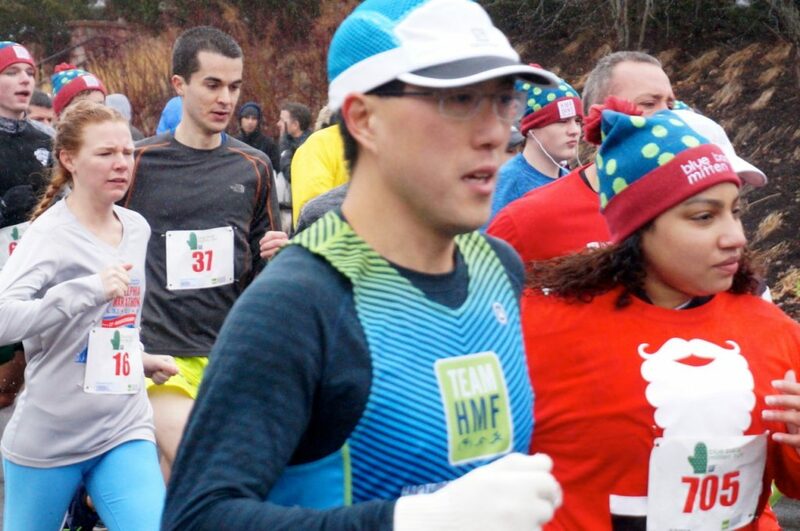 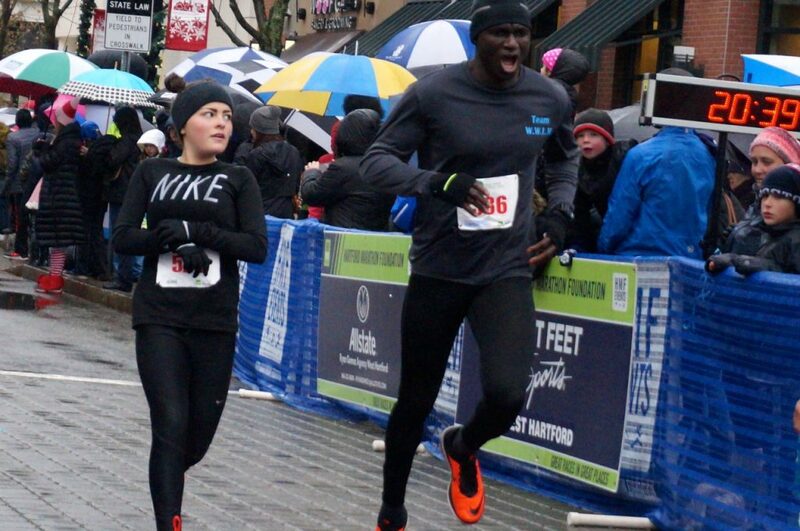 Organizers said that there were 1,800 registrants, including 140 for the HMF FitKids race for children ages 2-11 ,who were given the opportunity to run distances of ½ mile or one mile. 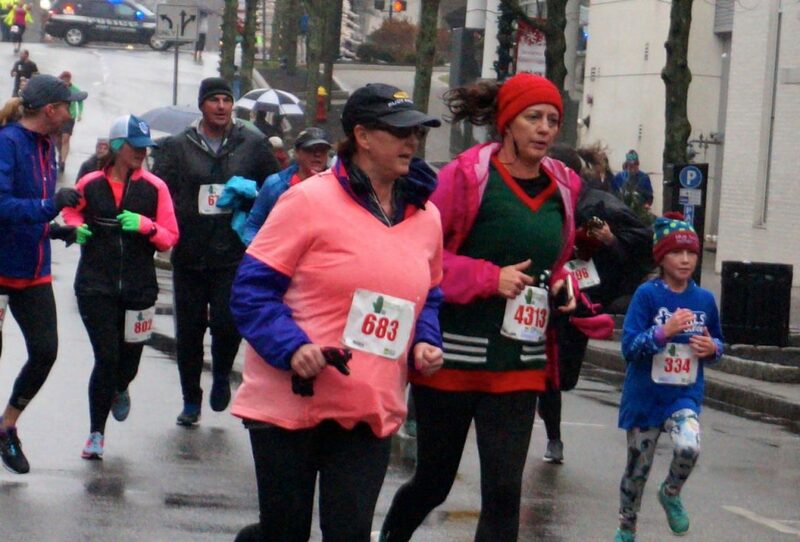 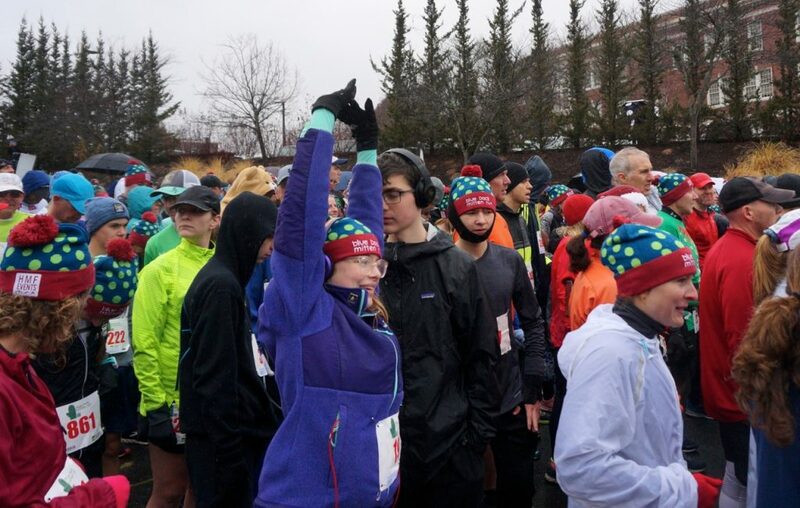 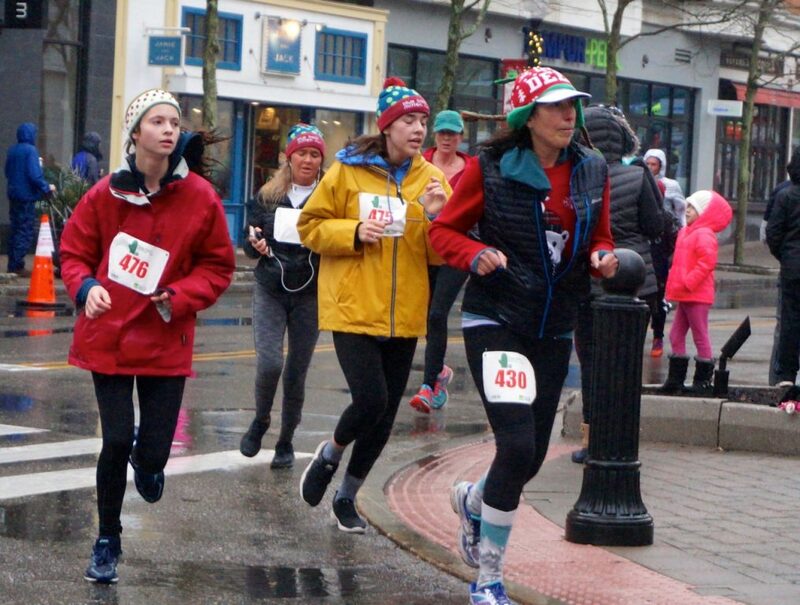 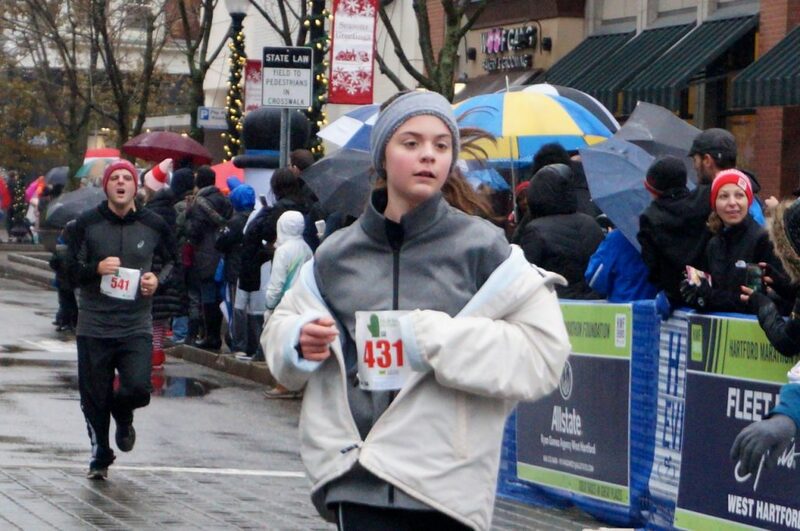 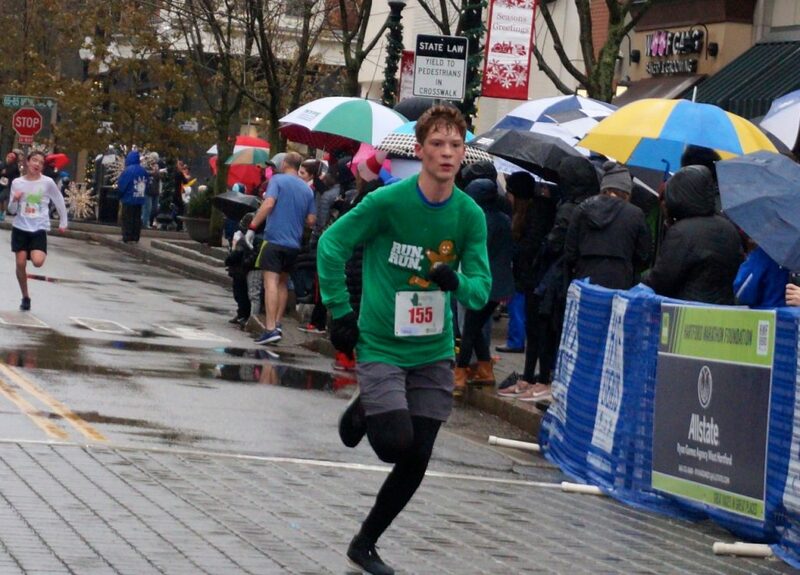 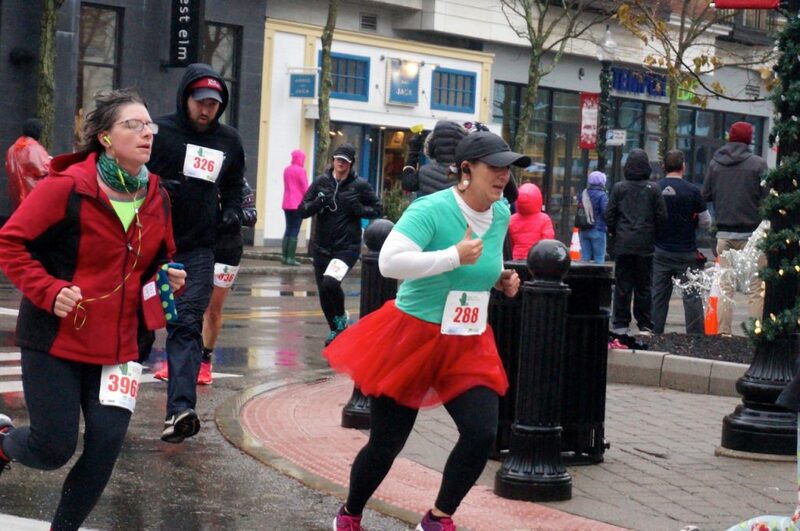 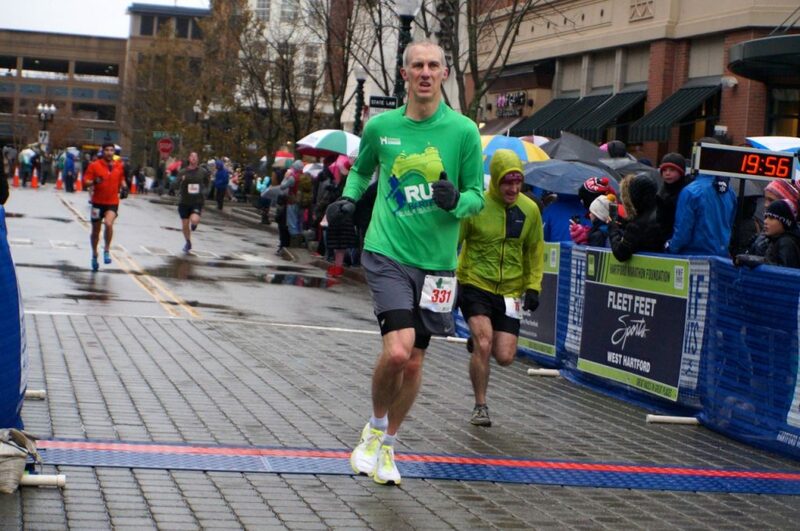 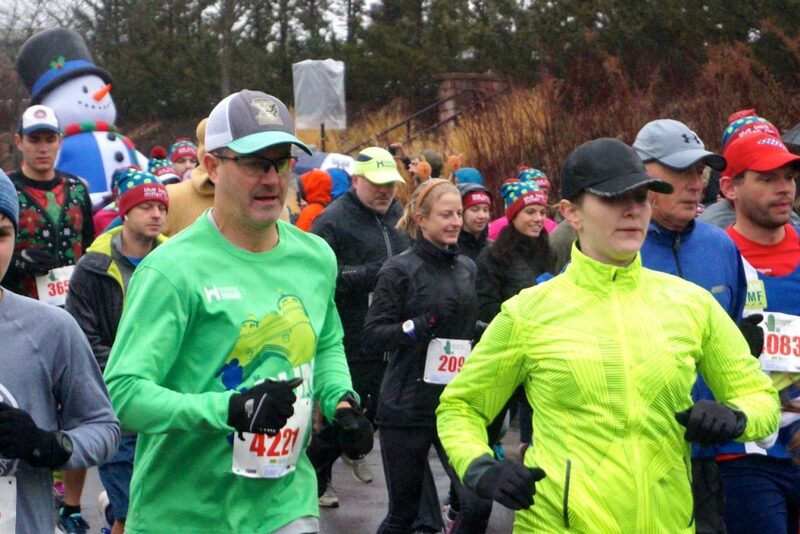 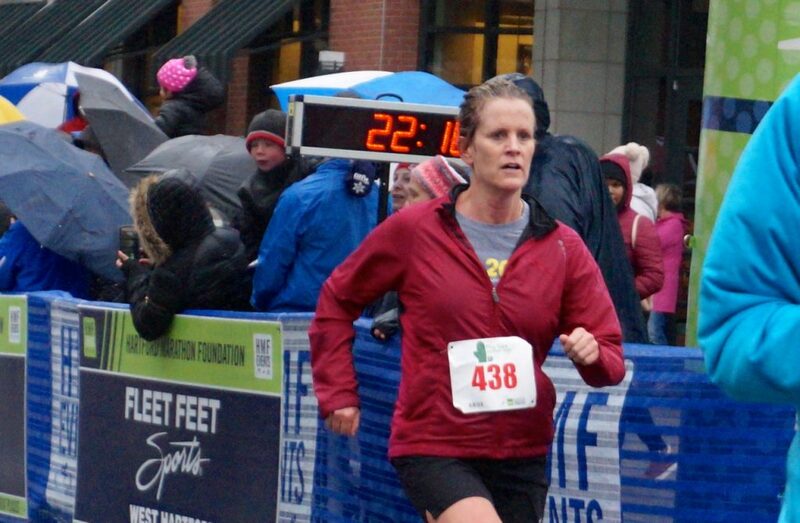 Because of the weather not everyone showed up on race day, but organizers were pleased that about 1,300 finished the 5K race, including a large contingent from Girls on the Run. 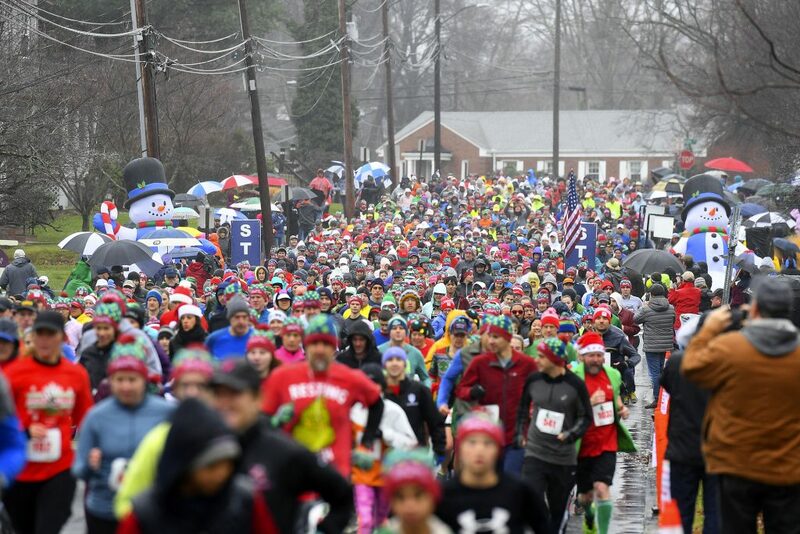 A gallery of images from the race is below. 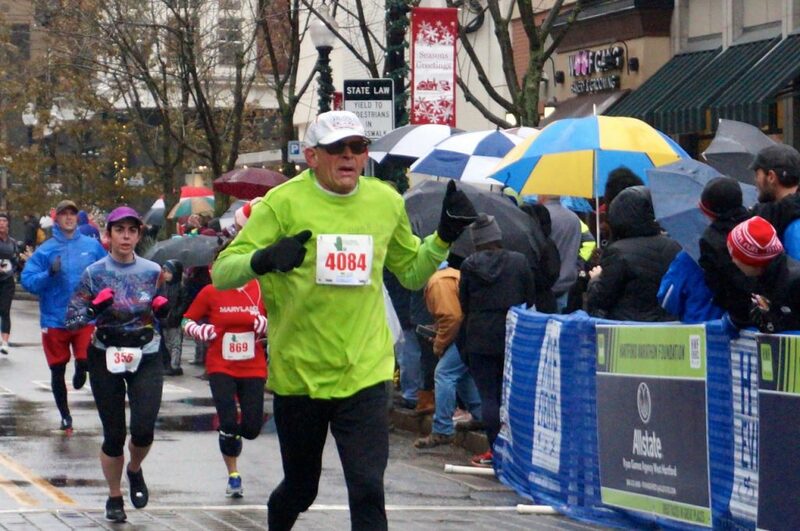 For complete results, click here.